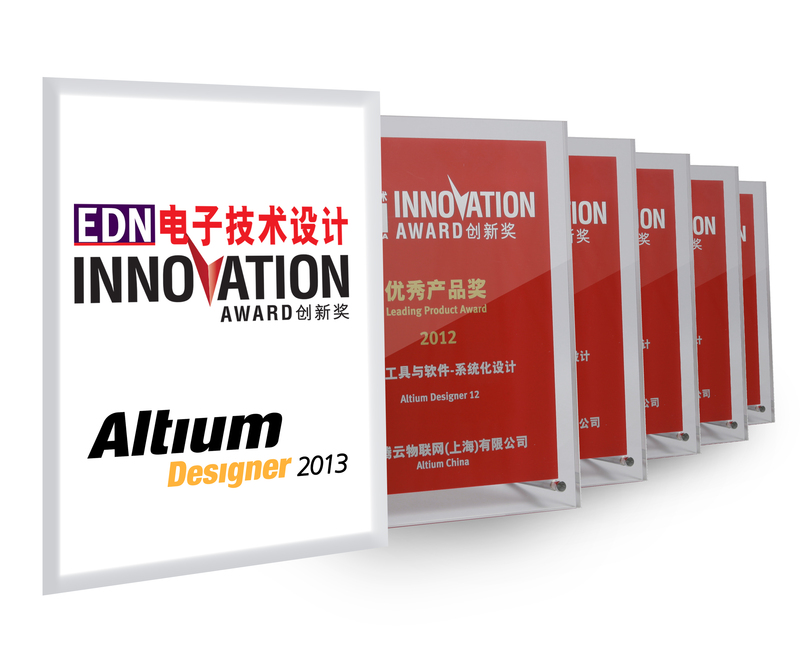 Shanghai, China – November 28, 2013 –Altium Limited, a global leader in Smart System Design Automation and provider of advanced 3D PCB design solutions (Altium Designer) and embedded software development (TASKING), has announced that Altium Designer 2013 has been honored with the Excellent Product in Development Tool and Software category of EDN China Innovation Award 2013. This year’s award marks the sixth consecutive year that Altium has won in this category. The EDN Innovation Award, which originated in Silicon Valley, is widely recognized as the most prestigious award in the micro-electronics field. Since 2005, EDN China has organized the Chinese version of the award annually to encourage innovation in product design, and help boost the rapid and long-term growth of China’s electronics industry. This year, EDN China invited 500,000 engineers and online users to participate in online voting for the 2013 Innovation Awards. The selection process was comprised of three phases: nomination, online voting and expert identification to ensure professionalism, authority and fairness. Altium Designer 2013 is a significant milestone in the company’s history as it not only delivers new and enhanced features, but also opens up Altium’s design platform to key partners. This creates a range of opportunities for users, partners and system integrators and represents a quantum leap for the industry. Altium Designer 2013 further improves the design environment for users by delivering several new PCB features and updates to the core PCB and Schematic tools. The recently released Altium Designer 14 further extends the advantages of Altium Designer 2013 by providing industry first support for flex and rigid-flex design. This enables engineers and design teams to reduce workload as well as improve efficiency, which allows customers to lower the design cost and provide innovative differentiated electronic products for the market.